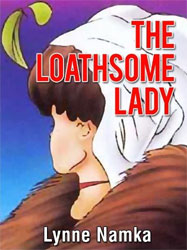 The Loathsome Lady is a romp of a wicked and bawdy fable, the way a much-loved knightly tale should be, told by a wise-cracking storyteller who speaks of the great vexing of love. It all starts with a dire threat to have King Arthur’s head. The grand and gruesome details of this oft-told-down-through-the-ages legend are all here: The Giant’s churlishness and his ready battleaxe, the Good King’s dilemma, the Old Hag’s despicable appearance and her outrageous bargain, Gawain’s chivalry and that most famous question of all: “What Do Women’s Hearts Most Desire?” With these humorous challenges how could anyone ever get to their Happily Ever After? Need we say more? Well yes, and in this update of the old Welsh story of enchantment and disenchantment, you just might learn something that might be useful to you about breaking love spells and of the battle between the sexes which has been going on since time immortal but never won. Take heed, for if you are a man, our tale just might help you avoid an outbreak of that well-known malady—THE DREADED LUV PAIN!